What if an atheist wrote about the Holocaust? What if, instead of a Jew, a gentile atheist was arrested and thrown into a concentration camp? 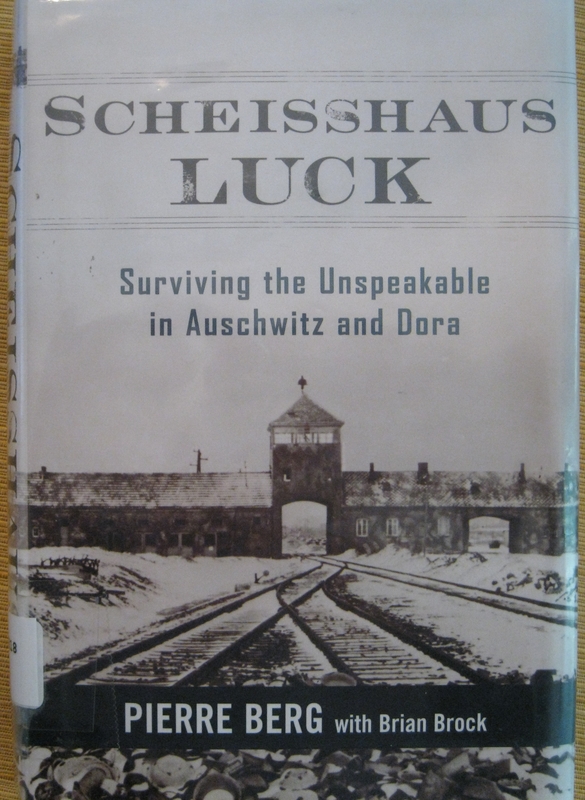 That’s exactly what happened in the book Scheisshaus Luck, Surviving the Unspeakable in Auschwitz and Dora by Pierre Berg with Brian Brock. This is Pierre’s actual story of enduring the Holocaust. Although Pierre was a member of the French Resistance, he was arrested by the Nazis while visiting a friend who was being arrested for owning a short-wave radio. Wrong place, wrong time. Pierre was a teenager when he was arrested and sent to Drancy, where he met a girl named Stella and fell in love. His love for Stella weaves in and out of the story, a thread of hope for him to look forward to in the future, as he endures hell on earth day after day. After leaving the concentration camps and getting back home, Pierre sat down to write his memoirs while still fresh in his mind. After a few attempts to have it published, he put it in a drawer and moved on with his life. Fifty years later, he pulled out the draft and worked on it with Brian Brock, a writer. It became the book, Scheisshaus Luck. The book is not merely a retelling of the atrocities committed, but an emotional roller coaster through the eyes of a teenager whose world is spinning out of control. That’s what makes it so different from other Holocaust stories. …with our traveling companions, twelve hundred prisoners of the Third Reich. If the Nazis found that message and connected it to me, it would be certain torture and death. No, [this time] we were going to travel like farm animals. From the shadows appeared ghastly creatures dressed in blue and gray striped uniforms. I couldn’t believe they were human. The only thing I cared about was my stomach’s incessant crying. There are lots more, but that is a sample of how good this writing is. This sounds like an interesting book. I am putting it on my list. This one has to go in my book list. Marie, I loved this book. It was so different than other Holocaust books I’ve read. He also is quite a voice against the “holocaust deniers” movement, as he is a gentile. Interesting stuff!